In a 2016 Republican primary debate, then-candidate Donald Trump promised to “replace Obamacare with something so much better.” Like every Republican in the race, he endorsed proposals to allow Americans to purchase health insurance across state lines. This month, the Department of Health and Human Services issued a formal Request for Information to help advance the policy. Equivalent insurance coverage can cost more than twice as much in some states than others, and so the benefits for consumers are potentially substantial. But will President Trump have any more luck tearing down restrictions on competition that Republicans have been trying to eliminate for decades? Given the disruption this would mean for the politically powerful healthcare industry, the odds aren’t good. The Constitution’s Commerce Clause is intended to prevent states from impeding trade across their borders with protectionist legislation. When the Supreme Court in 1944 ruled that insurance regulation was a federal responsibility, the insurance industry successfully pressured Congress to enact the McCarran-Ferguson Act. That legislation delegated federal regulatory powers over insurance to the states, and protected state insurance regulations from pre-emption by federal law. The health insurance industry, which was then in its infancy, has therefore grown up fragmented by state boundaries. Like automotive or financial sectors, healthcare has high economies of scale, and single states offer little room for competition between multiple efficient organizations. Although no insurer has a national market share above 13%, the largest insurer in each state has an average market share of 49%. Section 1333 of the Affordable Care Act therefore sought to allow states to combine their markets, so that insurers could compete by selling Obamacare plans across state lines. Analysts are nonetheless skeptical that this will do much to reduce healthcare costs, and no state has yet pursued this option. The American Academy of Actuaries notes that health insurance premiums largely reflect the underlying costs associated with the delivery of medical care, rather than the degree of insurance market competition. They argue that out-of-state insurers are kept out by the difficulty of establishing provider networks, and that even if they could enter, newcomers would have less leverage to negotiate good rates from hospitals and physicians than incumbents with large market shares. Yet, health insurance premiums vary substantially between states, and there are often major price disparities in neighboring counties across state borders. For instance, equivalent benchmark plans on Obamacare’s exchange in northeastern Oklahoma counties (Cherokee, Delaware, and Mayes) have premiums between $600 and $700, whereas those in neighboring counties (Benton, Crawford, and Washington) across the border in Arkansas cost $200 to $300. Such major disparities consistently track state borders in all regions of the country, outweighing variation in costs driven by local demographics and provider market structures. To a large extent, this reflects the flawed design of the ACA’s insurance market regulations, which require premiums on the exchange to be set at uniform levels within state-regulated risk pools, without regard to individuals’ expected healthcare needs. As a result, only low-income individuals eligible for subsidized coverage and those already sick have been eager to enroll, and average premiums for ACA plans far exceed the likely medical costs of most enrollees. The Trump administration recently used loopholes in the ACA’s regulations to make available affordable alternatives costing less than half the price of equivalent ACA plans. But this has been of little help to individuals living in some blue states, several of which have enacted regulations to restrict access to such options. The administration is therefore right to seek ways to enable consumers to purchase affordable coverage available from other states. Insurance regulators play an important role in making sure that insurers pay claims as advertised and have adequate funds to do so. But, too often, state regulatory power has been employed to license insurers to overcharge, rather than to protect consumers. State governments often operate with meager resources, and are therefore highly vulnerable to interest group capture. If regulations mandate more generous health insurance coverage, then hospitals, doctors, and drug-makers, as well as insurers, each stand to receive greater revenues—and so state regulatory interventions tend to rapidly drive up the cost of insurance. The structure of insurance markets greatly influences the ability of providers to inflate and pass on costs. Indeed, Blue Cross hospital insurance plans were initially established by the American Hospital Association for the sake of bolstering hospital revenues, and the AHA in most states secured favorable tax and regulatory policies to protect them from competition. By providing open-ended reimbursements to facilities according to the expenditures they incurred, such insurance plans caused hospital costs to soar. Over more recent decades, insurance market regulations have become one of the main instruments of hospital protectionism. When HMOs began to squeeze hospital costs, states enacted coverage mandates and network adequacy requirements, which have since caused hospital costs to resume their ascent. If individuals were allowed to purchase plans from other states, regulators in each state would be forced to put the interests of consumers above those of insurers and the rest of the healthcare industry. A 2008 study by the Department of Health and Human Services therefore estimated that the reduction in premiums resulting from allowing individuals to shop for insurance across state lines could reduce the number of Americans uninsured by 12 million. Large employers who self-insure are already exempt from state health insurance regulations, helping 96% of firms with over 200 employees to cover their staff. The Trump administration in 2017 issued an executive order to make it easier for smaller employers to combine and participate in similar arrangements, but it is widely believed to lack the legal authority to do so for individuals. While a few states have unilaterally allowed their residents to purchase insurance coverage from elsewhere, states with the most costly protectionist regulations clearly have little interest in doing so. Steven Calabresi of Northwestern University Law School, one of the founders of the Federalist Society, has argued that the delegation of insurance regulation to states is unconstitutional because “Congress can no more license the states to discriminate against interstate commerce than it can license them to violate the Contracts Clause.” Although the U.S. Supreme Court now counts five Federalist Society alumni among its members, it nonetheless seems unlikely that Justice Roberts would be eager to unleash a policy revolution by suddenly striking down a 75-year-old Act of Congress, which America’s entire healthcare industry is built around. Although the potential gains from allowing interstate insurance competition may be substantial, they are proportionate to the disruption they would cause to the healthcare industry – and therefore face strong political opposition. While various bills, such as those sponsored by Tom Price and Rand Paul, have sought to permit the purchase of insurance from across state lines, such legislative provisions would be subject to a filibuster and therefore did not feature prominently among 2017 GOP attempts to replace the ACA. Unless Republicans gain a strong congressional majority and a more intense commitment to eliminating procedural obstacles to healthcare reform, the proposal to allow the purchase of insurance across state lines is therefore likely to remain a mere aspiration. 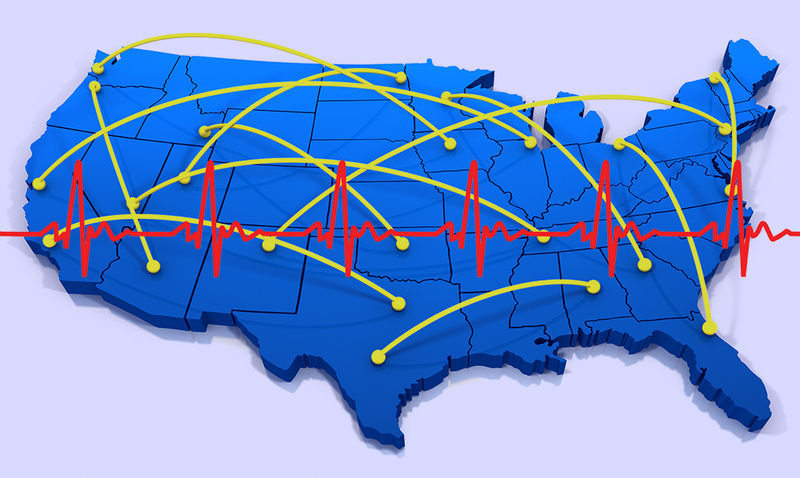 Those in states most prone to protectionist healthcare policies may well therefore have to get a different job to get access to affordable health insurance coverage—or to move to another state entirely.